I love your shaped card! It's so fun! Thank you for joining us at Cupcake Inspirations! This card really is just stunning. I love the unusual shape, and the gardner in me really loves the theme. Great use of our flower theme and thanks for playing with Cupcake Inspiration. This is so cute! Love that it is shaped like a pot of plants and loving the play on words! Nicely done! 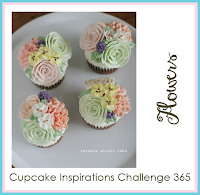 So glad you were inspired by this week's flowers challenge at Cupcake Inspirations! Gorgeous card for your Mum,Jenny.Love the shape and the beautiful flowers.Enjoy your weekend. This is so cute! Thanks so much for joining the Cupcake Inspirations challenge. Good luck! Guaranteed your mom will adore this pretty floral card, as do I! Sooooo sweet! Thank you for sharing your creativity in the Cupcakes Inspiration challenge! Kjempekoselig kort du har laget. Takk for at deltar i utfordring hos Card and Scrap.